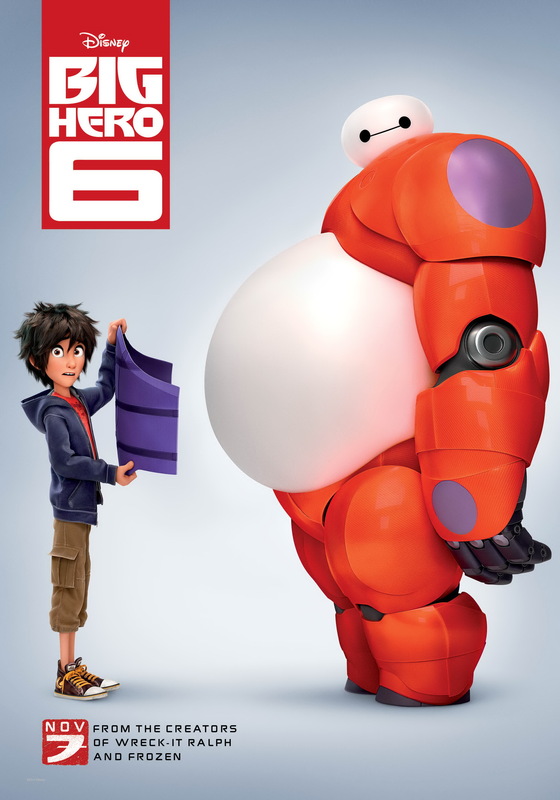 Normally I review books in this space, but I’m going to change course just a bit here this month and share my thoughts on the film Big Hero 6. If you’re not sure how that relates to Japan, read on! Given the considerable marketing push, at least here in Japan, I’m sure most – if not all – of you have by now trotted off to the theater to see this offering from the animation studios of Walt Disney. If not, you should go. You really should. It’s the story of a teenage genius, Hiro, who is inspired by his older brother Tadashi to enter university and study robotics. A tragic fire at the university on the eve of a robotics exhibition results in the death of Tadashi, and the downward mental spiral of his younger brother. However, Tadashi’s contribution to the scientific community was Baymax, a healthcare robot who helps patients resolve their health issues. He starts to work with Hiro to help him overcome his depression. However, the two soon become embroiled in saving the city from an evil villian (trite, but I can’t think of a better description without giving anything away!) who is using Hiro’s revolutionary robotics technology for his own revenge-fueled purposes. In case you can’t tell from the names, Hiro and Tadashi are Japanese-American. Or American-Japanese. It’s hard to decide, as they live in a city called San Fransokyo, a mix of … well, I’m sure you’ve guessed. It’s one of Disney’s most successful-ever blends of two cultures, maybe because they weren’t trying to make you believe you were in one culture or the other. You’re in BOTH. At the same time. And it works beautifully. Cable cars run up and down streets full of cherry blossoms, monorails zoom over streets filled with pachinko parlors and noodle stands, and the “Golden Gate Bridge” is painted red and given upturned ends just like the torii gate at an Inari Shrine. Hiro’s aunt serves American food at her cafe but has notes in hiragana written on her kitchen blackboard and two Japanese dolls in her foyer. Even Hiro’s name is given dual treatment – most characters say it with a “regular” r but one girl rolls her “r” just like a Japanese speaker, making his name sound more like “hee-do”. Unlike some films that beat the ninja or samurai angle to a pulp, Big Hero 6 focuses more on Japan’s recent contribution to the world – robotics. I found the entire opening sequence – where the main characters showcase their particular inventions – to be utterly believable and even inspiring. In fact, perhaps due to my belief in the ability of the exhibited technology, I found it actually much harder to suspend my belief in reality (as one must do in a movie based on a comic book, of course) when Baymax and Hiro enter a time portal near the movie’s end. I personally thought that scene pushed the envelope a bit but if you are taking it in the context of a superhero movie, it’s probably right on par. This was the first movie we ever took my 4-year-old to see in the theater. She found it funny – especially the parts she had seen over and over again in previews – but I’d say it will be much better appreciated by those in elementary school or above. And, as has become a recent trend in Disney’s animated movies, adults are well-catered to, with inside jokes and a few sweet Easter eggs (look for a Stan Lee portrait in one scene and even cameo at the film’s end). I walked out of the theater feeling stupidly giddy – I”d just seen a movie that was funny and smart, AND had treated both of my “home” countries/cultures in just the way I would have liked to see them portrayed. Japanophiles, even if you’re not into animated films or superheroes in general, this is one film that is definitely worth your time. Great indepth review – can’t wait to see the film myself! I think it’s one of the best I’ve seen in a while. I have wanted to see this ever since I saw the first ad on TV. Still haven’t. I really have to convince Joe to go. As much as he likes some movies, he’d rather watch them at home. I am emailing this review to him to make sure he is motivated. Thanks, Mandy! I hope you can convince him to see it, Gwen, even if it is at home! Now I need to buy the DVD, Celia, so I can pause it at certain scenes and look for all of the neat cultural details they added. I was surprised I caught the hiragana on the chalkboard!